Tuesday, January 29th, 2013 . Monday, January 28th, 2013 . Got a need for speed? 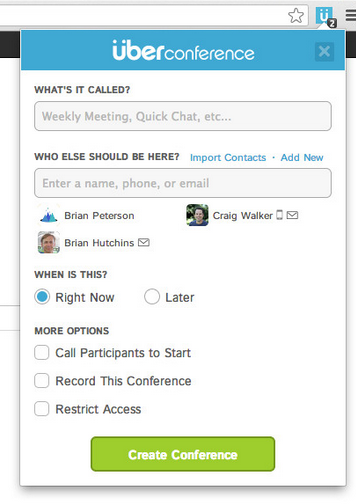 Now you can schedule conference calls even quicker, right from Chrome. All you need is the new ÜberConference Chrome extension that is now available in the Chrome web store. Once you install the extension, you will see the ÜberConference logo in the top right of your Chrome browser. When you click that icon, a window will appear that will let you immediately start or schedule a conference call, just like it works on the regular site. Previously we launched a Google Chrome app to make it easier to get to the ÜberConference site, and the new extension simplifies starting conferences even further. The other nice feature we have for Chrome is the ability to join conference calls from anywhere through your Internet connection without even picking up a phone. Check out the new extension! Wednesday, January 23rd, 2013 . Creating an intuitive document management system takes smart thinking, and companies like Box and Evernote do a great job with these core features and more. Which is why we’re happy to announce that ÜberConference has integrated with Box and Evernote to bring integrated document sharing to all conference calls. 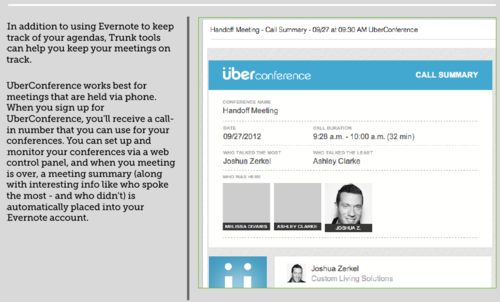 Just link your Box or Evernote account to your ÜberConference account and choose which files to share. When you share items during a call, we add a thumbnail of the document to the ÜberConference and all participants can access it by clicking on it. Each participant’s view is independent, so different people can view different files at the same time. At the end of the call, links to the notes and files are included in the call summaries for easy reference. Box makes it incredibly easy to view and share all types of files and business documents, like Word, Excel, Powerpoint, and Acrobat files, right in the browser through its integration. 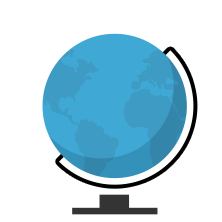 The embedded Box widget has a number of smart control features built in so you can page through documents, rotate and resize images, and switch in and out of full screen view all within UberConference. Evernote is an awesome way for people to remember everything, and many ÜberConference users already use our feature for automatically saving call summaries to their Evernote account. With the new release of Evernote Business, it’s even easier to collaborate on shared business notes, and we are excited to be one of the first companies to develop an integration with this new functionality. We have also added in another smart, Related Notes function that Evernote offers, which will automatically find notes that you might want for the call based on the conference name and participants in the call. Tuesday, January 22nd, 2013 . Do you have international conference calls? Now people from all over the world can dial into your conferences with their phones. Today, we’re happy to announce conference call international access numbers in over 40 countries across Europe, Asia and South America. Participants in ÜberConference calls can use these in-country local numbers to avoid expensive international calling rates when calling a US conference number. Additional country codes will be added in February. We recently launched a feature that lets participants join an ÜberConference from their computer from anywhere in the world. Now people can also easily dial in from their phone with our international access numbers. After dialing the access number, they just punch in the conference call number, then PIN, and get connected. This new international access number feature is available and included automatically at no extra charge for all ÜberConference Pro and Business accounts. ÜberConference Free accounts can upgrade to Pro for just $10 a month to get a local number ($20 for toll free) and several other premium features such as larger conference sizes, recurring conferences, outbound dialing and more. Check out the full list of countries with international access numbers, and our FAQs if you have questions on how they work. Wednesday, January 9th, 2013 . 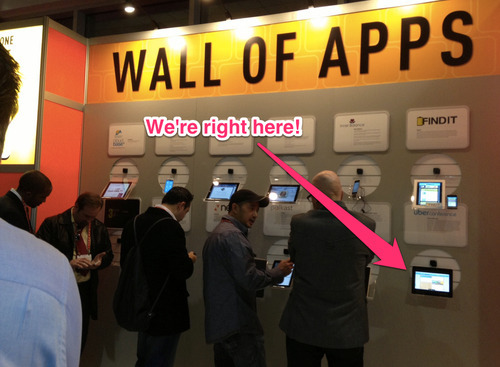 The big trend at this year’s CES is ‘mobile first’. 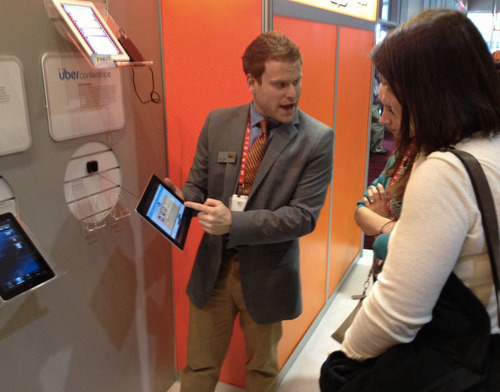 The Consumer Electronics Association (CEA) says this is the largest app event in the world! And our newly released mobile apps for iOS and Android are a part of it. This is Brian Page from Vice and he is awesome! He’s working with the Wall of Apps folks and also incredibly helpful demoing UberConference to folks who come asking about our conference call mobile app. What a guy! 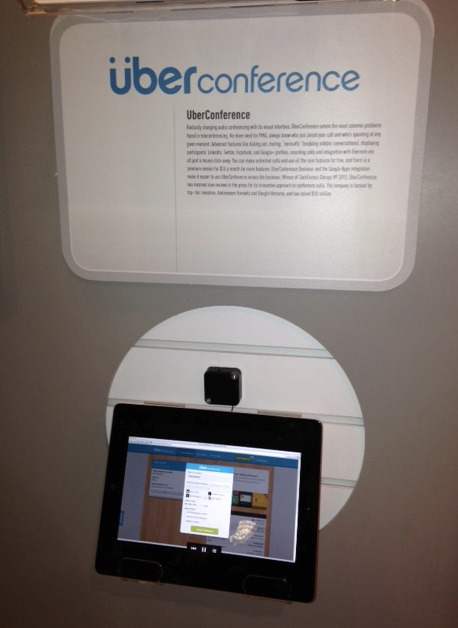 Come find our team (or tweet us if you prefer) @UberConference to let us know you’ve been by.